Living a Fit and Full Life: Journal Your Heart Out with the NIV, Journal the Word Reference Bible from Zondervan! Journal Your Heart Out with the NIV, Journal the Word Reference Bible from Zondervan! The NIV Journal the Word™ Reference Bible allows you to capture your thoughts next to treasured verses while cross referencing Scripture in the accurate, readable, and clear New International Version (NIV) translation. This single-column, red-letter edition features thick paper with lightly ruled lines in the extra-wide margins, perfect to reflect on God’s Word and enhance your study. Journal your heart out with the NIV, Journal the Word Reference Bible from Zondervan! The NIV, Journal the Word Reference Bible from Zondervan is the perfect Bible for those that love to take notes and journal. It's lined with wide margins for notes and reflections which are the perfect size. I also love that the paper is thick so your writing won't bleed through the paper. The text is easy to read and I especially like that it lays flat on a desk for easy note taking. 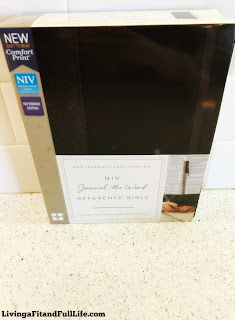 The NIV, Journal the Word Reference Bible from Zondervan is a terrific Bible that will surely be cherished! You can find NIV, Journal the Word Reference Bible, Hardcover on Amazon, Barnes and Noble and other bookstores.